Here is another card made with "Zoe & Gemma Snow Fun" from Wags 'N Whiskers Stamps. 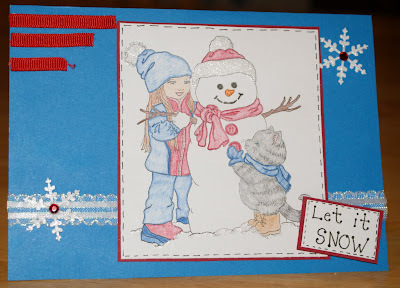 This time I decided to make this a "patriotic Christmas card" by using the colors red,white & blue as my focal colors. Creatalicious Challenge: Make something for Christmas & include snowflakes & lots of sparkle/glitter. Great card! I love the touch of red ribbon on the corner! Thanks so much for playing along with us at Creatilicious...hope you'll join us next month. Great card! I love the colors you used and your faux stitching! Thanks for playing along with the Wags 'n Whiskers Challenge. This week we have an easy one...buttons! I hope you can play again! So adorable,love the image and your fabulous colouring!!! Thanks for joining us at Creatalicious.